In the previous blog we talked about creating a slider rail for HandlePod using a three-foot length of wood and a yardstick—all for less than three dollars. The rail can be placed on many surfaces to provide a smooth, flat slider for tracking video using a smartphone with a tripod adapter or any small, video capable camera. But you may also want to attach the slider to a tripod to raise it higher and be able to place it in any desired location. A 1/4-20 T-nut secured to the bottom of the slider rail provides a tripod-mounting thread. Adding a tripod mounting thread to the slider is extremely easy to do and takes just minutes. All that’s needed is a ¼-20 T-nut. These are available at Orchard Supply. A package of four costs a whopping $1.29, which barely breaks the three dollar mark for the entire set up. Use a 9/32” bit to drill a 3/8 inch deep hole in the center of the wood 18 inches from either end. Then insert the T-nut into the hole and pound it down with a hammer. Just to make sure it stays in place, I added some Crazy Glue to the T-nut before hammering it down, but it’s probably not necessary. 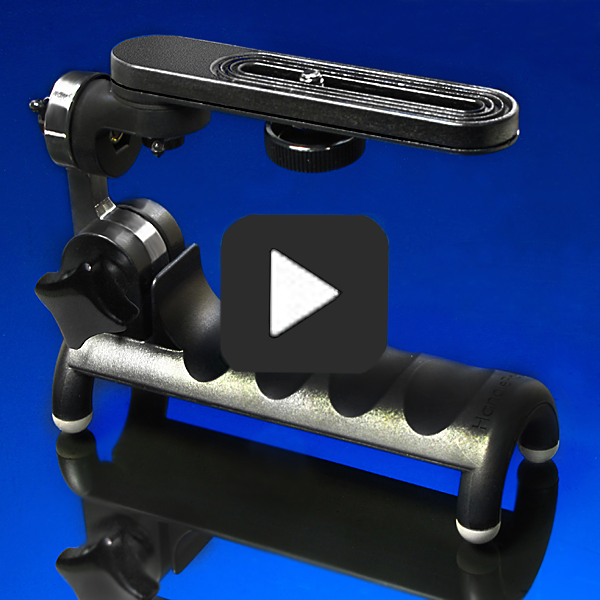 Secure the HandlePod slider to a tripod for smooth tracking video in any location. Now you can screw the slider onto any tripod and it will easily support a smartphone or small camera. For use with a larger camera like a DSLR, it is best to support the slider with two tripods, one at each end. Just install two more T-nuts at both ends of the slider as described above. Now you can support the slider at both ends and position it at any desired location or angle. You can also use two small, inexpensive mini-tripods to support the slider at a low angle on uneven surfaces like dirt or rocks. With the slider and HandlePod you can easily create Hollywood-style tracking moves in any direction—left to right, push in, pull out, even vertical. Click here to see examples of when to use a slider. And with the slider mounted on a tripod you can do even more. All you need is a Velcro covering on the HandlePod feet and it will glide effortlessly across the slider rail or any available smooth surface. This entry was posted in Tripod Alternative on January 3, 2015 by main user.